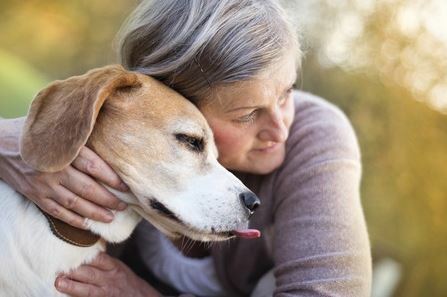 Caring for an aging dog or one that has some behavioral concerns requires a lot of time and money, and many dog owners find it is difficult to manage this, both emotionally and logistically. At Silver Streak Kennels, we understand, and our facilities are designed to provide a comfortable and inviting environment that serves aging dogs, dogs in need of long-term boarding and dogs with special medical needs that their owners cannot meet. The important thing that we work to emphasis with each of our clients is that while we may home your dog, every pup at Silver Streak still belongs to their respective owners. Our facility is simply a place for your dog to go to feel comfortable and be taken care of when this is no longer feasible at home. Owners are always welcome to come up and visit their dogs or even take them for a week or a weekend to spend some quality time together. Dogs are incredible loyal and they never forget the people with whom they’ve spent a majority of their lives. Yes, many dogs do live out the rest of their lives here, but their owners are encouraged to be a major part of that time. Some of our owners pick up their best friends for a vacation or a long weekend. In some cases, dogs have a short stay here, but for good reasons. For example, sometimes dogs have issues with anxiety, but after spending some time in the relaxing farm-life environment at Silver Streak, some dogs are able to be weaned off their medication by our vets. Once they can function properly without them, they can often return to their families, more well-adjusted and socialized after their time with us and able to rejoin their loving owners. Silver Streak Kennels can be the proverbial “farm upstate” for some of our oldest canine guests, but it doesn’t mean that we’re the end of the road. Dogs are incredibly loyal and loving, and it’s important to remember that while we can provide a comfortable, social and caring environment, nothing will make a dog happier than seeing their owner – if even for just a few hours. At Silver Streak Kennels, we’re available to help dogs with special needs or medical needs as well as provide long-term boarding for owners who may need to travel for a long period of time or are going on a military deployment. To learn more or to find out how you can help support the care of these wonderful dogs, call us today at 607-263-2007 or email us at silverstreak@frontiernet.net. ← New York Post Highlights Silver Streak!